The founder of the Merovingian Frankish kingdom was Clovis. He followed an aggressive policy of conquest to build up the kingdom over much of modern France, but his death in 511 saw his realm chopped up into several smaller kingdoms. It was Frankish custom to divide territory between surviving sons, a practise known as partible inheritance, and the event of Clovis' death proved no exception (something the Merovingians were never able to change). The kingdom was divided four ways, creating Austrasia, Paris, Orleans, and Soissons (although the latter had already existed as a separate domain until its conquest by Clovis in 486). 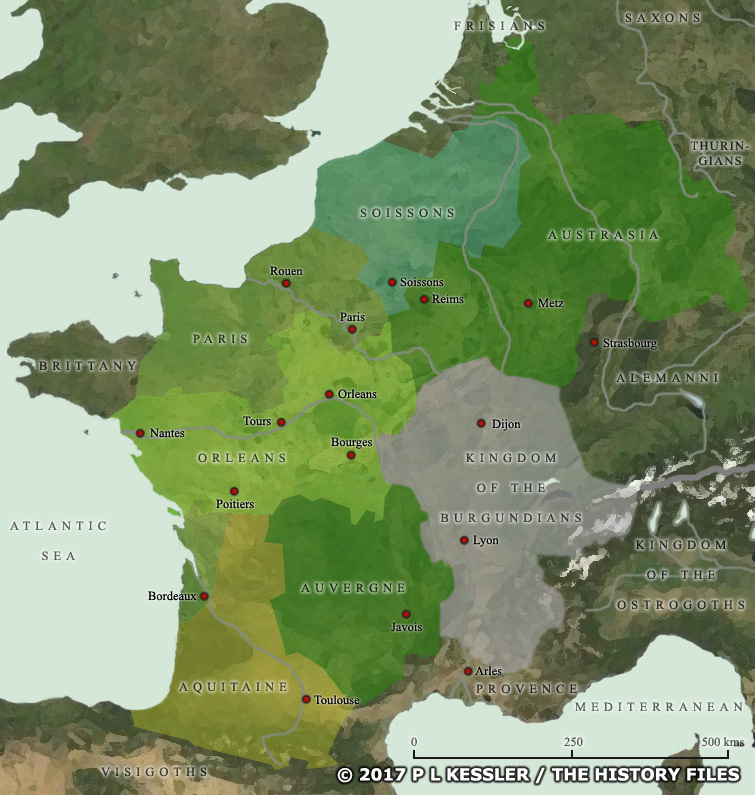 Even so, the Frankish domains were seen as a single realm that was ruled collectively by several kings. As Soissons formed the heartland of Frankish power, Clotaire, king of Soissons, was also acknowledged the senior king of the Franks. Three other Frankish regions, Bordeaux, Aquitaine, and Auvergne lay to the south of Orleans. Bordeaux was held by the king of Paris, Auvergne was part of the territory of Austrasia, but who held Aquitaine is not known. It was probably only loosely held by dukes whose master continually changed during the frequent fighting between the kingdoms, and may even have been partially held by the Visigoths who had only recently been expelled from the rest of Gaul. The territory of the Alemanni had been conquered in 496, and was probably associated with Austrasia during this period. While Soissons seemed to be almost the smallest of the four, its ruler, Chlothar I, was strong enough to survive. In 531 he conquered the Thuringians. In 534 he added the Burgundians to his territory, and in 555 the Bavarians were conquered. Between 555-561 he also held Austrasia, and in 558, on the death of his brother in Paris, he gained both Paris and Orleans. However, it would be a long time before the Frankish realms were fully reunited. To select a state or territory for further information, click on its name or anywhere within its borders.